MinerBumping.com: Who Do They Think I Am? 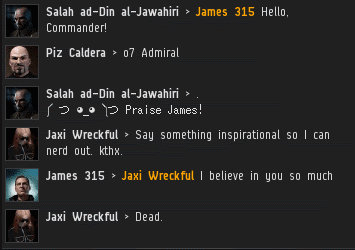 The good news is that most highsec players have at least heard of me. 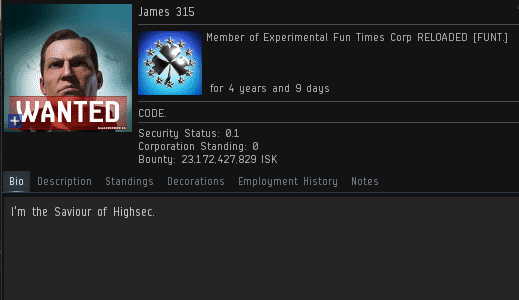 Because EVE's population is concentrated in highsec, and because nearly all of highsec's content is concentrated in the New Order, I am probably the second-most widely recognized player in the game. 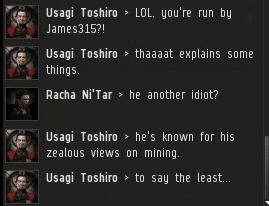 Before the typical new player ever gets a grasp of who's who in nullsec, he's been ganked and heard "Praise James!" a dozen times or more. Name recognition is a very low bar, though. 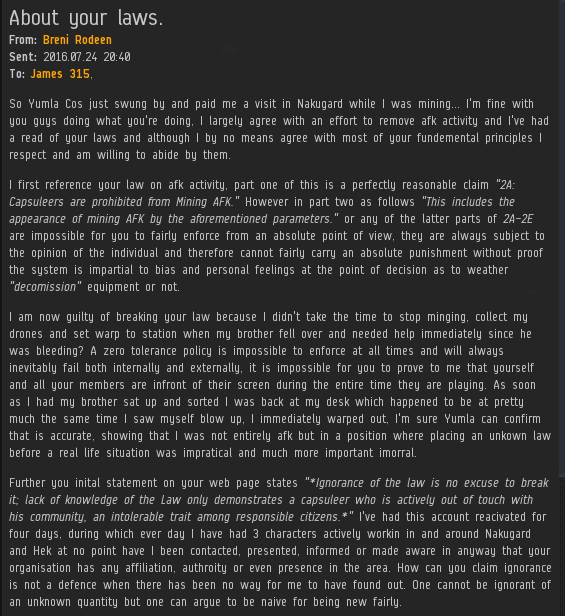 Many carebears get caught up in rumors about me being permabanned or quitting the game or being a bully, etc. All false. To the average carebear, I have become a sort of bogeyman. Miners gather around the campfire and try to scare each other by telling James 315 stories. 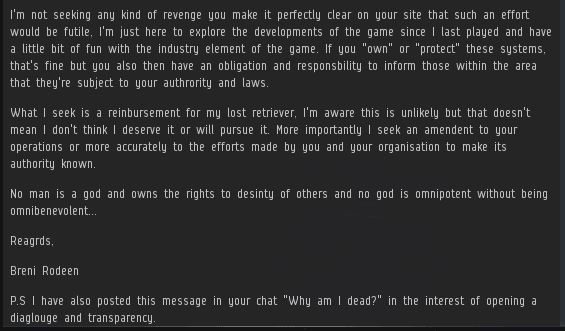 Some think it's my job to handle their complaints, like I'm some kind of customer service representative for highsec. ...While others think that I'm a piggy bank whose job it is to send them isk. Where did these guys get the impression that I'm made of money? Even people who have never spoken to me before assume that I'm a sympathetic ear for whatever they want to talk about. And a very patient one, at that. ...I'm the Saviour of Highsec. The truth was right in front of you all along. That Breni Rodeen gives us a good idea of the risk-averse attitudes of many carebears. He seems to think that losing a mining ship to is a crisis that should never happen to anyone. Absolute safety and predictability are paramount to him. Does his brother really start bleeding, while our Agents are patrolling, frequently enough to warrant a new clause in The Code? Breni would be well advised to accept his 50 cent retriever loss and be glad that his brother is OK and that Highsec is in good order. Predictable is a bad thing, one must strive for new tastes new adventures new risks and new fun or else it just gets old. Hell that's why its so important to remind these people that routine is a scary place to be. Stuck in a never ending loop that goes no where and has no meaning. So what do we do, we give them a bit of chaos and watch their whole world explode around them, and those who learn go on to better more meaningful lives and explore a rich and wonderful universe. Those who don't become our playthings to do with as we please, milk them for delicious tears and watch them melt down with every cut. Their reality is so fragile. I never liked that reality anyway. Time for some guzzler tears! He may try to disguise his tears, but the salt is undeniable. Oh good I hope he gushing plenty of salt I am in the mood to go hunting and I need salt to make a large brick of lick for a bait area. Screw it lets just tie him to a tree and let dear get it from the source, But I warn him now, I may shoot through the animal and I always eat what I kill. Haha! Just the little fillip I needed after a long evening's graft among the synths. Thank you, James; long may you reign! Reign in the miners for a good shooting gallery. Lord knows they act just like little target ducks, back and forth, back and forth. To answer your question, I think they think you are a faggott. Just a guess though. OOOOHHHHH Someone got touched in the NO NO place and needs a hug. I can help you with that, for a 10 million nominal fee and a signed agreement that you will abide by the code. If not, I will have to touch you again. And a short life for the miners. Breni Rodeen is a self-entitled cuck. He tries to act witty and logical but then still sticks bends over for the the Savior ram. 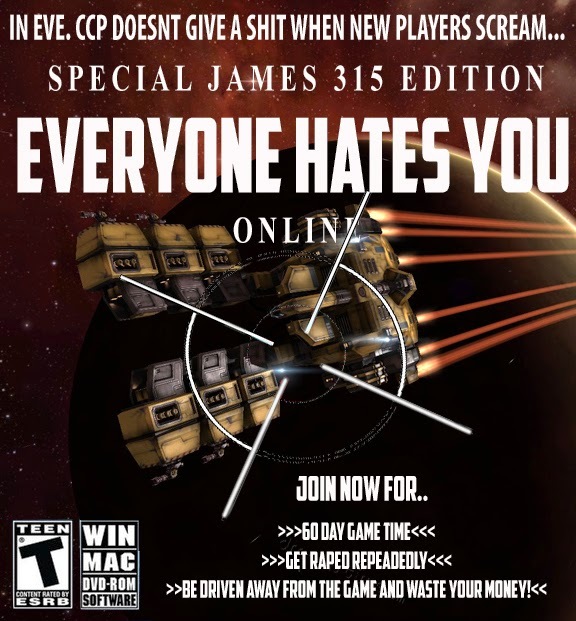 Miners are the lowest life forms in Eve.